In my last post I wrote about the most recent devastating poaching event in Cameroon, in which hundreds of elephants were gunned down by poachers for their ivory. Efforts to stop the slaughter in countries all across Africa are underway but the problems are numerous and include rangers being out-manned and out-gunned by armies of poachers who arrive on horseback with advanced weaponry and an almost complete lack of government funding for anti-poaching efforts. But I have to celebrate even the small efforts, and the short video below from the New Zealand Herald demonstrates one of the ways Kenya is battling back by attaching radio collars to elephants. This will enable the wildlife officials to track them and know better how to direct the on-the-ground teams deployed to fight the poachers. As an aside, this week I am attending the veterinary forensics conference put on by the International Veterinary Forensic Science Association (IVFSA). It is my third IVFSA event and I have enjoyed all of them and I will be posting updates as to the goings-on down here in beautiful Miami! Back in July I posted about the elephant poaching crisis and some of the positive things that were happening to combat it: https://animalcsi.com/2011/07/19/some-small-successes-for-a-jumbo-problem/ . Unfortunately the year is not ending on such a high note. Recently there have been a large number of articles and news stories about the rapid decline of elephant populations due to poaching. In fact, according to an article in the UK Daily Mail, 2011 has been the worst year for elephants since ivory sales were banned in 1989, with 2500 estimated to have been slaughtered. 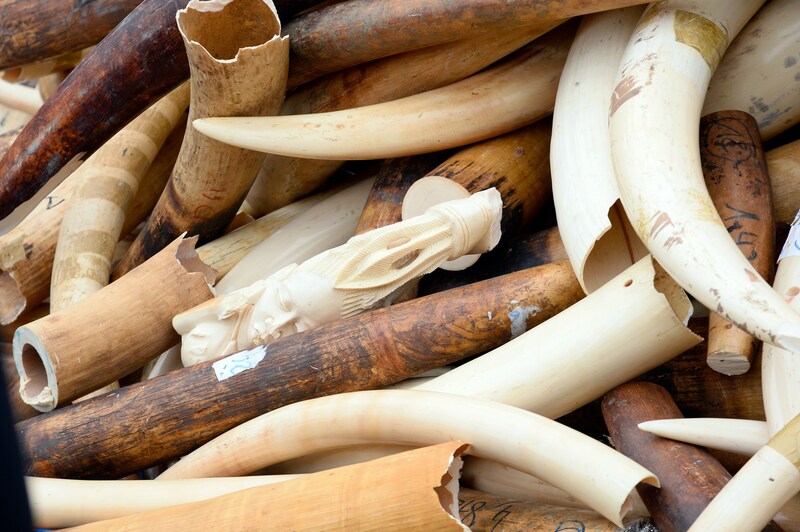 The same article goes on to say that a record number of illegal ivory shipments were seized as well: “A record 13 large hauls were seized this year – consisting of an estimated 23,676 kilograms of the desirable product; it is a dramatic rise from 2010, when just six major seizures took place, of tusks weighing just under 10,000kg, and the worryingly high number does not even include the ivory that is being smuggled over borders secretly” (http://www.dailymail.co.uk/news/article-2079791/Worst-year-elephants-ivory-trade-banned-large-scale-tusk-smuggling-hits-record-high.html?ITO=1490). Just this month saw the largest ivory seizure ever recorded: 15 tonnes in a port near Kuala Lumpur, Malaysia. From Wildlife Extra News: “Prior to this the largest seizure was of around 6.5 tonnes in Singapore in 2002. If we estimate the tusks of an African elephant weigh 30 kilos each, this haul represents the death of 250 elephants! The shipment originated in Mombasa, Kenya, and was hidden inside containers marked as ‘sandstone-made handicraft’. Authorities in Malaysia have valued the shipment at approximately £15 million” (http://www.wildlifeextra.com/go/news/ivory-smuggling011.html#cr). TRAFFIC, the wildlife trade monitoring network, has said that the gangs responsible are increasingly sophisticated and well-funded, and are changing their preferred method of shipment to sea rather than air. Their routes are changing as well, to avoid detection. The majority of shipments are bound for Asia, but “once inside Asia, the documentation accompanying an onward shipment is changed to make it appear as a local re-export, helping to conceal its origin from Africa” (http://www.traffic.org/home/2011/12/29/2011-annus-horribilis-for-african-elephants-says-traffic.html). An article on the website allAfrica.com states that in Uganda elephants are being poached even inside national parks: “The Uganda Wildlife Authority (UWA) [showed] that the numbers of elephants killed in parks since the year began have more than tripled. According to UWA, 33 elephants have been killed at Murchison Falls National Game Park in the last seven years, of which 25 have been killed this year”. The entire article can be read here: http://allafrica.com/stories/201112050626.html. And this is only ONE PARK!! As lucrative as the drug trade, poaching for ivory brings in big bucks. The allAfrica.com article states that a “kilogramme of ivory on international market goes for between $1,500 (about Shs3.8 million) $4,000 (about Shs10.2 million) and a pair of tusks from a mature elephant can weigh about 40 kliogrammes” (http://allafrica.com/stories/201112050626.html). DON’T BUY IVORY OR ANYTHING YOU EVEN THINK MIGHT BE IVORY! Donate to the Wildlife Conservation Society or other organizations like them who are working within the countries hardest hit to establish stronger patrols. Educate yourself and others! Talk about this! Spread the word! The more people who know about this massive issue the better. I so desperately want him to be wrong. I can’t imagine a world without elephants. Someday I hope to be out there studying them. Like Dr. Liz Bennett states in the video, even if you never see an elephant in the wild, the fact that they are out there makes the world a better place. Please join me in this fight. I want to see 2012 be a positive year for the elephants, and for all of us.